Chicago | Reuters — U.S. corn futures fell to contract lows on Tuesday on forecasts for crop-boosting rain and milder temperatures in the heart of the U.S. corn belt, with three-quarters of the nation’s crop already in good-to-excellent shape. Wheat futures tumbled more than three per cent on dull export demand and improving spring wheat crop conditions. Soybeans rebounded from early lows and briefly traded higher on bargain buying, but prices remain anchored by trade tensions with top buyer China and expectations for a sizeable U.S. harvest. The U.S. Department of Agriculture lowered its crop condition ratings for corn and soybeans only slightly in the latest week. Ratings for both crops remain near historical highs. “Soybeans and corn are being weakened by positive U.S. crop conditions seen by the USDA while the U.S.-China trade war is also undermining soybeans,” said Matt Ammermann, commodity risk manager at INTL FCStone. Traders looked beyond forecasts for above-normal Midwest temperatures this weekend as cooler, wetter weather was expected in the six- to 10-day outlook. 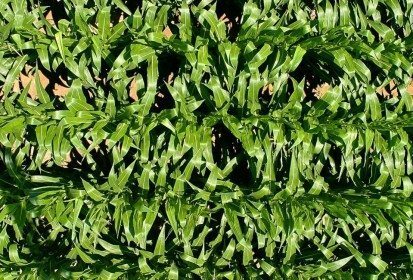 Much of the Midwest corn crop will be pollinating in the coming weeks, a period when stressful weather can limit yield potential. Chicago Board of Trade September corn futures were down 6-1/4 cents, or 1.8 per cent, at $3.47-3/4 a bushel after hitting a contract low of $3.44-1/4. July 2018 through July 2019 contracts all set life-of-contract lows, along with the May through September 2020 contracts. CBOT August soybeans ended unchanged at $8.55-3/4 a bushel. CBOT September wheat fell 16 cents, or 3.1 per cent, to $4.92 a bushel, with selling accelerating as the contract dipped below its 20- and 200-day moving averages. Spring wheat ratings in USDA’s weekly crop conditions report were above trade expectations, fuelling expectations that the agency may boost its U.S. wheat production forecast in a monthly report later this week. Sluggish export demand also weighed on wheat as major importer Egypt bought 175,000 tonnes from rival supplier Russia in a snap tender. USDA is expected to begin cutting forecasts for U.S. soybean exports and increasing projected stockpiles as the trade war with top soybean importer China disrupts shipments. — Karl Plume reports on agriculture and commodities for Reuters from Chicago; additional reporting by Michael Hogan in Hamburg and Colin Packham in Sydney.